How is the building attached to the ground? We prefer to use heavy duty hot-dipped galvanised steel brackets cast directly in to the concrete footing/slab. Click here for a description and diagrams depicting our hold down system in comparison to alternative systems. How are the knee and apex joints fixed? Garage World uses a patented bracketry system known as MorindaTM Knee & Apex Joints which are a full single piece of steel which wraps around the joints and is secured on both sides with the use of heavy bolts and screws to fix it. Click here for images. At Garage World we include as standard: colour coded screws, custom flashings, vermin protection, windlocked roller doors (in cyclonic regions), Colorbond downpipes, and sheeting that is 0.42 BMT (Base Metal Thickness) which is equivalent to 0.47 TCT (Total Coated Thickness). We waited 5 years to get our double carport and boy, did we shop around! 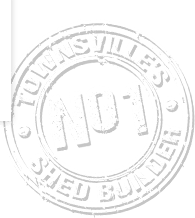 Our decision to use Garage World Townsville really came down to the professionalism and quality of the product." Can you custom design the building to your specifications? At Garage World we custom design all our structures and you can view them on our 3D software package. No need to just accept standard sizes from a catalogue that don't meet your exact needs. Is the company Shed Safe Accredited? Enter your postcode on the Shed Safe website to search. Ensure the company is an Accredited Seller, not just using an Accredited Manufacturer. Refer to the Shed Safe website for further information. Is the structural steel and sheeting made in Australia from Bluescope Steel? At Garage World we use Australian made products from Bluescope Steel because of their superior quality and because we like to support fellow Australians. What type of Vermin Protection is included with the shed? With a Garage World shed we use vermin flashing rather than a rebated slab system because it has the benefits of adding an attractive finish to your shed, and does not void your sheeting warranty or result in rusting of the tail ends of your wall sheeting as is the case with a rebated slab system. Click here for more information. Wind/Cyclone Ratings is the quote site specific? To ensure that your building is designed appropriately to withstand the weather conditions of your exact block of land, the design of every building must be developed specifically for your site, and reviewed by an independent engineer. For a list of wind rating information that should be included on any quote you receive, click here for more information. Is the company a QBCC Licenced Builder? Do an online Licence Search at www.qbcc.qld.gov.au. For instructions on how to complete a Licence Search and what it all means click here. Is the company Financially Secure and what is the company's Allowable Annual Turnover (AATO)? Do an online Licence Search at www.qbcc.qld.gov.au. The licence search will provide details of the company's AATO category. For more information on AATO click here. What have you heard about the company from other customers and what reputation do they have? At Garage World we take old-fashioned pride in our work it shows in everything we do. But don't just take our word for it refer to our Testimonials from other Garage World customers. Does the proposal meet your budgetary requirements? An experienced Sales & Design Consultant will be able to make adjustments to your structure that don't compromise on your core needs or quality, and can allow for expansion at a later date, or offer suggestions for alternative designs which may be more in line with your budgetary requirements. Just ask. At Garage World we have decades of experience not only in steel building construction but we also have professionals qualified in property valuation, accounting and business. Your project is an investment in your property and should be considered as such. Check out the Garage World Townsville team.